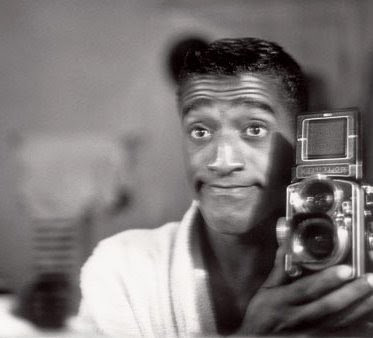 Besides singing and dancing, Rat Pack star Sammy Davis Jr. had another passion: Photography. He always had a camera on hand and took photos that often included his Rat Pack co-stars Frank and Dean, and other celebrities including Marilyn Monroe, Paul Newman, and James Dean. Sammy also captured up-close images of famous figures like Bobby Kennedy and Martin Luther King Jr. And he documented his everyday life as well as his participation in events like the 1963 Civil Rights march on Washington. 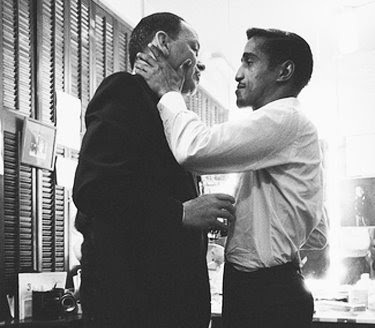 Sammy's camera work is featured in a book called Photo by Sammy Davis Jr. which also features recollections by Sammy's friend and associate Burt Boyar, who also collaborated with Sammy on two autobiographies of this versatile performer who's so important to any tribute to The Rat Pack. 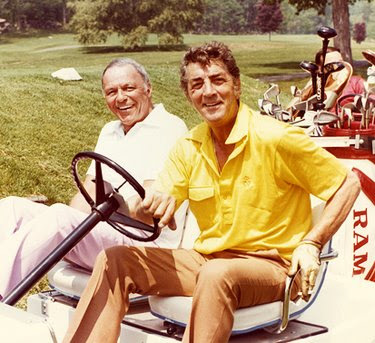 According to Frank Sinatra's longest running opening act, comedian Tom Dreesen who related this story to the Rat Pack Impersonators Group, a party one night at Dean Martin's house took an unexpected turn. The guys were all there, along with some other guests, as a trio played and people joked and drank. About 11:00 PM the doorbell rang and when Dean's wife answered it, she saw the police standing there. They told her that there were complaints about the noise. Jeannie was surprised, because she had alerted the neighbors that there was going to be a get-together, and they were all fine with it. Then Frank noticed that Dean was nowhere to be found. He went to Dean's bedroom where he found Dean on the bed. It soon became clear who blew the whistle. Dean, who had a passion for golf, explained that he wanted to get a good night's sleep and get up early to play, thus becoming possibly the first person ever to call the police on his own party. Rat Pack stars Frank Sinatra and Sammy Davis Jr. performed many solo hits during their Rat Pack years. But one song, Me And My Shadow, teamed up Frank and Sammy for some playful singing and dancing. And the lyrics about closeness between two friends fit them well. They even had a version with special lyrics making reference to things like the Kennedys with Frank and Sammy singing "we're closer than Bobby is to JFK". Their special lyrics also referred to Frank's restaurateur friend Toots Shor and Frank's best friend Jilly Rizzo, also a restaurant owner and regular Sinatra companion. Rat Pack fans might think the song originated with Frank and Sammy because it was so appropriate, but it had history long before they performed it. It goes back to 1927 and was written by Billy Rose and Dave Dreyer, with a credit also for Al Jolson, whose name often appeared with the writers. Me And My Shadow was performed by many singers over the years, including Perry Como, Judy Garland, Vic Damone and Peggy Lee. Today, the song is performed more than ever, as a regular number during shows by Rat Pack Impersonators. A performance of Me And My Shadow by Frank and Sammy appears on the DVD titled Sinatra: The Classic Duets. Labels: frank sinatra, rat pack, sammy davis jr.